[P1] Octopuses have blue blood, can change colors, and regrow their tentacles. But what really makes them stand out is even weirder: they can edit their own RNA. Following is a transcript of the video. [P2] Octopuses are the weirdest animal on earth. I know what you’re thinking… Is it because they have three hearts? Blue blood? That they can regrow their limbs? Or how they’re known to use tools? Or change colors whenever they want? And of course, all that is cool, but it’s just the beginning. [P3] Turns out, octopuses — and their close coleoid relatives — have a unique ability to edit significant amounts of their RNA. They’ve been doing this since before modern humans showed up 200,000 years ago. [P4] And while scientists aren’t sure how or why it started, studies suggest that octopuses today are editing their RNA to adapt to temperature changes in their environment. RNA is sort of like DNA editing but, in some ways, even better. [P6] But what makes RNA editing different from DNA editing is the long-term effects. Your DNA, for instance, is identical in each one of your trillions of adult cells. So, changing the code in one cell, changes it forever and fundamentally alters your genome, which is passed down to your children and every generation thereafter. [P7] This is how the majority of the animal kingdom evolves. But octopuses do things differently, by also editing their RNA, which allows them to “try out” adaptations in the short-term without messing with entire generations to come. [P9] Unlike DNA, changes to RNA are NOT hereditary. It also means that you can target certain body parts and edit the RNA in them individually. In fact, research groups have discovered that octopuses tend to edit the RNA in their brain tissue more than anywhere else. Which has led some experts to hypothesize this is why octopuses are the most intelligent of all invertebrates on the planet. [P10] Now, most organisms — including humans — have the enzyme necessary for RNA editing but the general consensus is it’s by and large just not worth the effort. Humans, for example, have around 10 RNA editing sites, but octopuses have tens of thousands. [P11] Prof. Eli Eisenberg: “It’s really a completely new story.” So, octopuses and their coleoid cousins truly are bizarre but it may not be the case for too much longer. Scientists have recently proven ways of using CRISPR to edit RNA, too. Perhaps they can learn a thing or two from the experts. e.g. Octopuses have eight tentacles. e.g. When children go to a different school, it usually takes them a while to adapt. e.g. Alcohol can alter a person’s mood. e.g. He suffers from a rare hereditary condition. 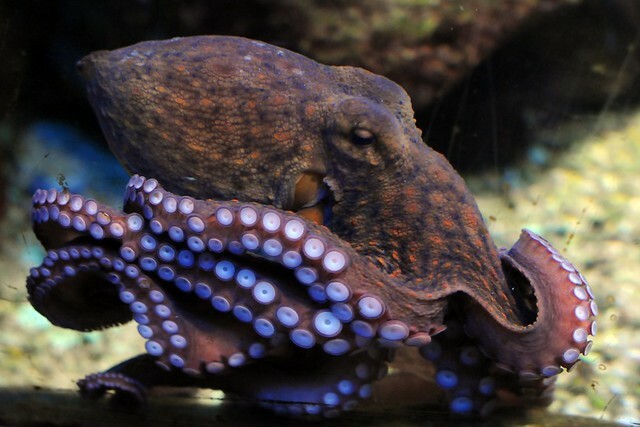 Why does the author say octopuses are the weirdest animal on earth? If you can change your body like an octopus, what would you like to be able to do? Share your thoughts with your Cambly tutor!